The Restitcherator: Do you like scrappy or do you like order? Do you like scrappy or do you like order? There are 8 prints from a Joel Dewberry line called Modern Meadow, and this great teal/turquoise linen. I figured out that I have 16 of each print, which is serious coincidence, or luck or something like that. 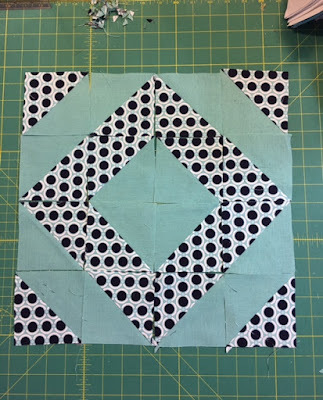 So I decided I love this diamond ring block and I have enough of each print to make 8 blocks like this. BUT, they can also be laid out with a scrappy look, using two of each print for the 16 pieces needed. Here's the thing, I think I like the scrappy better, but the linear thinker in me is kind of into the whole blocks in each print.